Have you seen the new Red Velvet M&M flavors?? They are SO.SO.GOOD!! We love them!! Kristi discovered them and brought a bag home…it was gobbled up immediately. We had our families be the taste testers who gave it two thumbs up! 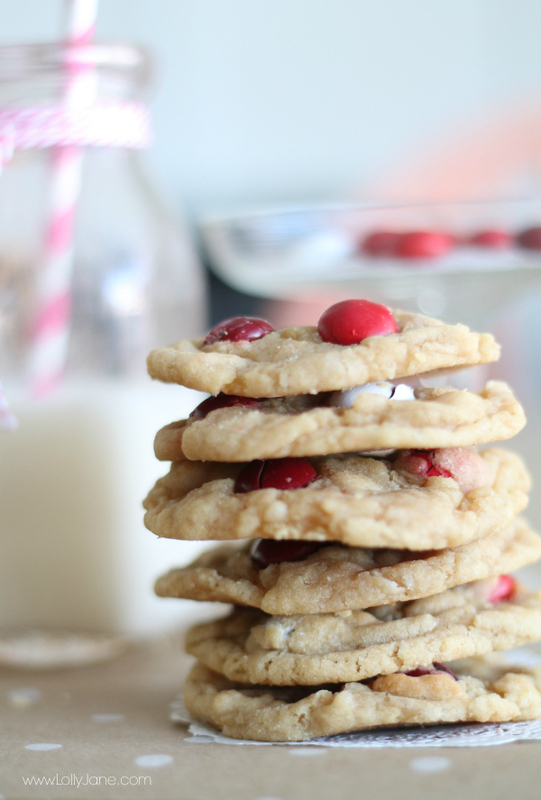 And because they’re 2 shades of red with a pretty white M&M, we thought they’d be perfect in our yummy go-to cookie recipe. And they are, everyone who ate one of these bad boys adored them. 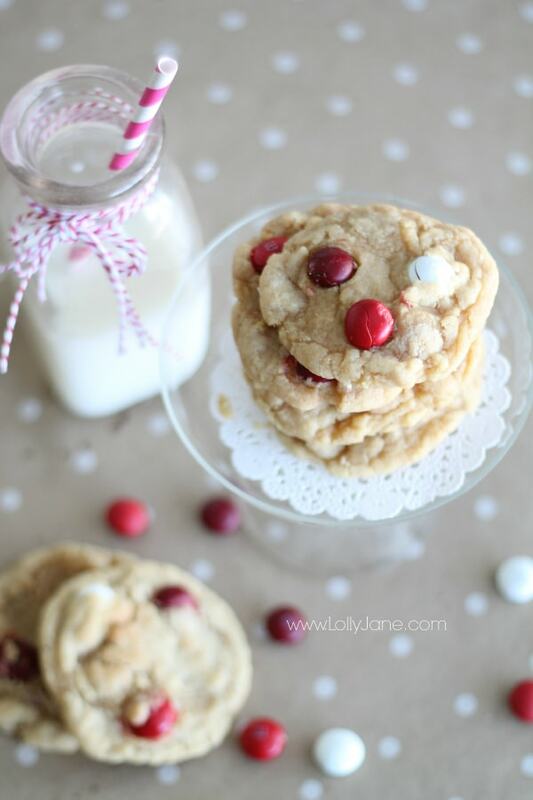 We hope you’ll try these Red Velvet M&M Cookies, they are soooo yummy!! 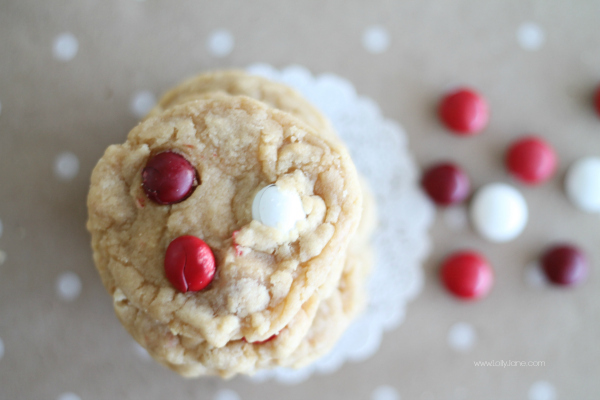 A perfect Valentine’s Day cookie! Cream together sugars, butter, oil and vanilla until smooth. Scoop your cookie dough ball like normal, placing 1 of each color M&M into the dough. Bake at 350 for 6-7 minutes, until golden brown. Note: By slightly under-baking them, they’ll be soft in the middle & crispy on the outside, mmm. as well as our tasty Red Velvet M&M Cake Mix Cookies, yum! 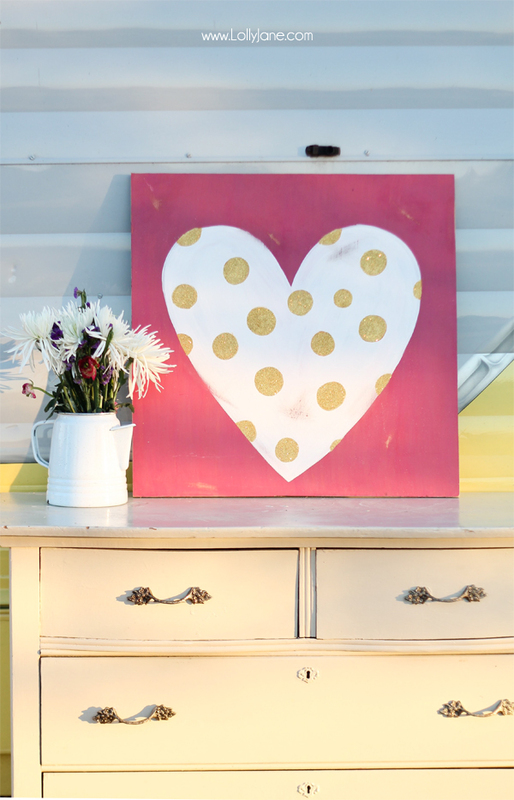 and our glitter heart sign. Mmmm, these cookies look and sounds deeelicious! These look positively delicious! The perfect cookie for a Valentine’s Day party. Totally on the hunt for those Red Velvet M & M”s!!! Yummy! Those sound amazing! And I love the pop of color the M&M’s give these cookies! Hey..! 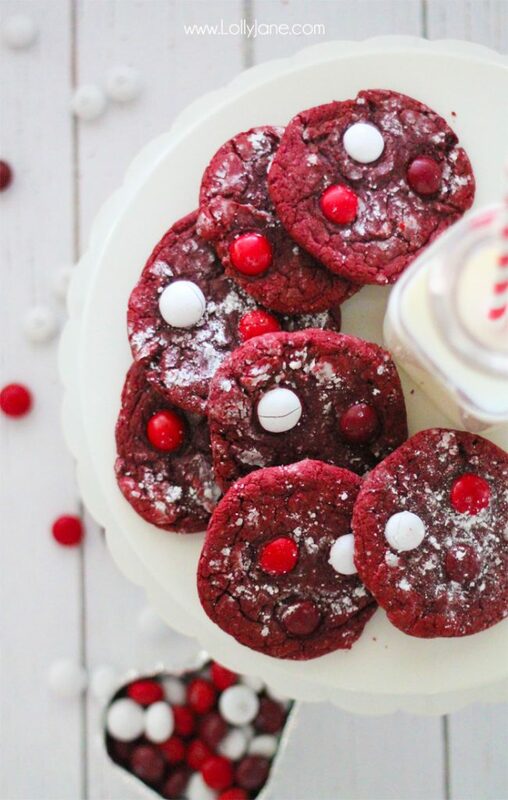 its rally amazing and these looks sooo yummy & beautiful and i really enjoyed your post, i will try to make this cookie in this valentine for their lover…Thanks for sharing and keep shared your new ideas with delicious recipes………! Thanks, Samantha! They’re SO yummy!! We hope you love them! I will only eat one. Maybe two. Who am I kidding these are going to disappear in a heartbeat! Thanks for sharing this week at Celebrate Your Story. These cookies look so delicious! I never knew that there was an existence of Red Velvet M&M’s! I need to try these! Thank you for this recipe! 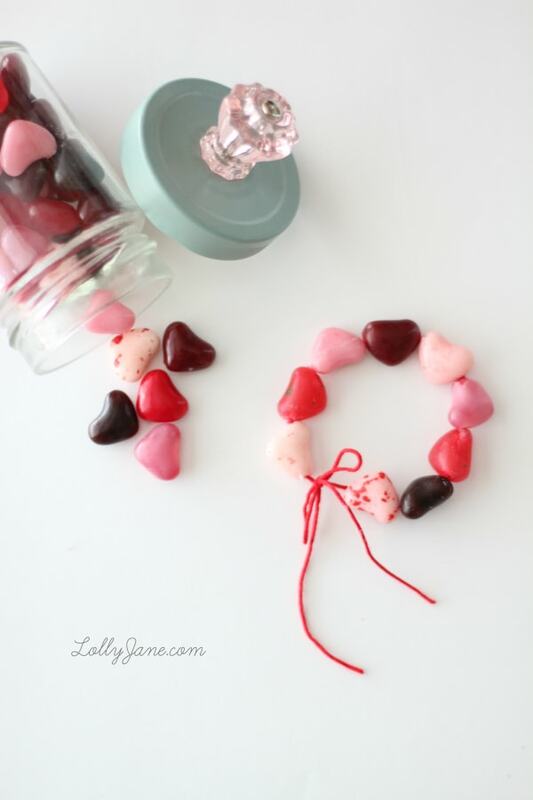 These look perfect for Valentine’s Day! I pinned this recipe to save for later! Thanks so much, Natalie! Hope you love them! Looks so yummy. Thanks for sharing at the Inspiration Spotlight party. Pinned & sharing. Had to PIN these… yum!! Thank you for sharing them at Create, Bake, Grow and Gather this week. I’m delighted to be featuring your recipe at tonight’s party. Red Velvet M&M Cookies a very special treat! Thanks so much for sharing your post with us at Full Plate Thursday. Have a great week and come back soon! OMG this is absolutely amazing. I follow the recipe step by step and it turned out amazing. Well stead of using 1/2 a cup of peanut butter i used 1 cup of peanut butter (The kids loves peanut butter). 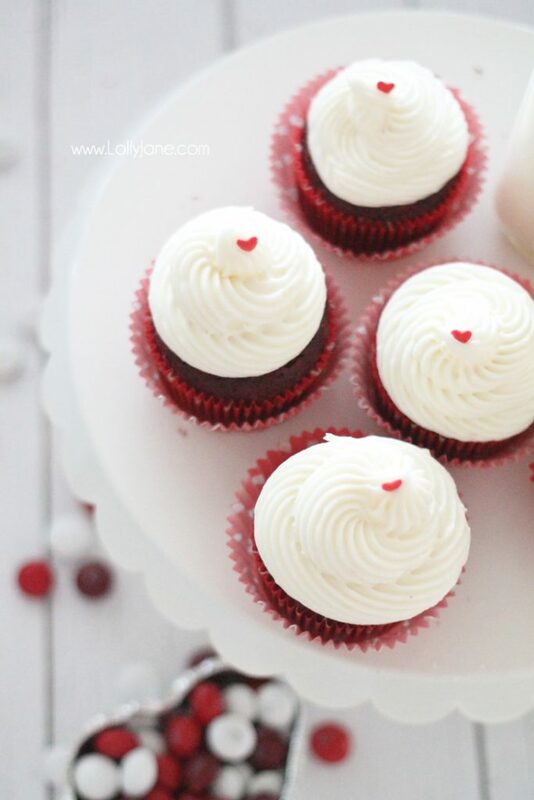 I’ll try to bake the red velvet cupcake next week. Yum!! 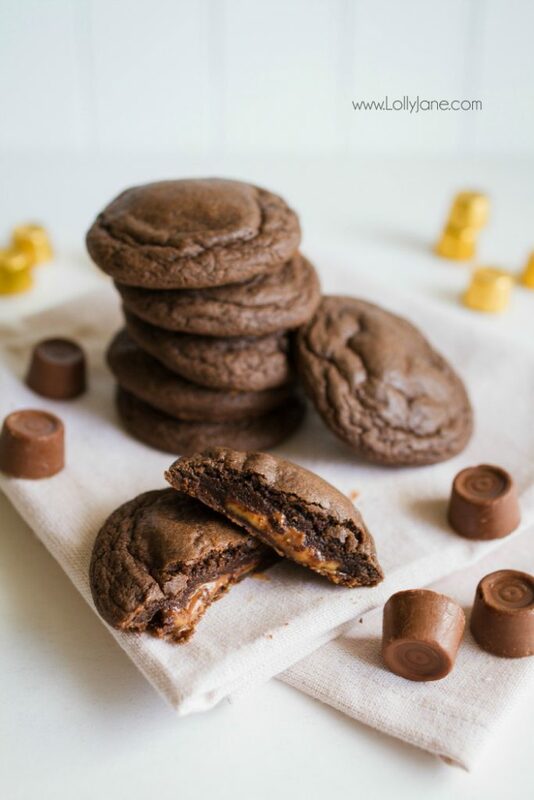 These look amazing and I really want to break my diet and make these NOW! Thanks for sharing! I’m so grateful to you as after reading your article. I have cooked Red Velvet M&M Cookies at my catering services in houston and guess what my clients are just loving it. I can’t thank you enough for this recipe and article. High Recommended !!! Amazing recipe, We would love to offer Red Velvet M&M Cookies in our menu. Thanks for sharing. Great blog! !